Barb Clifford is a human firecracker and a brand all of her own. She’s been a business owner and entrepreneur, today she’s a sky girl flight attendant, tomorrow she could be doing anything under the sun or over the moon- but all along, she’s always been a musician. A tough chick with a sweet smile, she’s been the driving force of The Honeybees, the preeminent female led band on the modern Rockabilly scene. 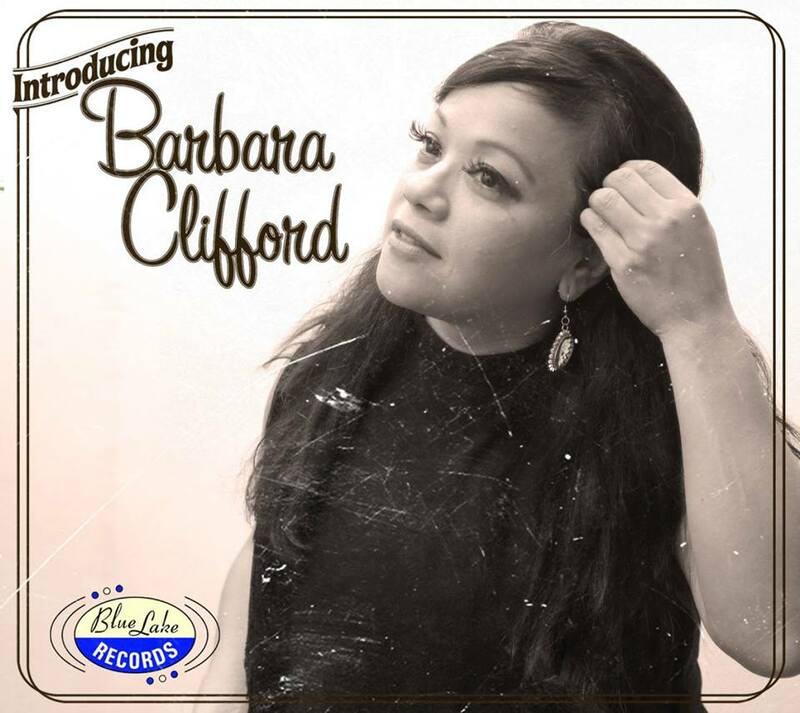 I caught up with Barb just before the release of her upcoming solo debut, Introducing Barbara Clifford. When did you first realize that you were a musician? Ha. Well, the minute I was born! Kidding, I dunno. When I was a youngster, my parents put me into tap, ballet, jazz and so on and became obsessed with the movie FAME! That led me to a high school that was a “performing arts school” here in Chicago. There I learned how to be part of a chorus, play piano, and auditioned for all the dances and plays I could be in. I come from a family of musicians. My dad (I heard) sang Rat Pack like songs in his day. Vocal stuff. My 2 brothers both play trumpet & trombone. My uncle (not blood related) played guitar. At one point, there was a band with all of them and somehow, my father recorded a record with all of them and got the horn section from Earth, Wind & Fire involved (There is a studio photo floating around my family somewhere of that). They never made it big. I used to watch MV3, an old California studio show that showed music videos before MTV was born. I saw my first The B-52s video called Legal Tender. Maybe that was the moment I decided I wanted to sing in a band. That band forever changed me. Ever since, I’ve been in a duo female harmony band! My dad also had an RCA album of Elvis that I burned out on the turn table. And he also had Dean Martin and Frank Sinatra records. I always had a passion for rockabilly/vocalists since those records. Although, I never knew there was more beyond that. How did The Honeybees come to be(e)? From my previous answer, after joining a duo female vocal band in my 20s, (The Bedbugs), I still always ended up learning more and more from Elvis, Sinatra, and my piano teacher, that there was more to this rockabilly, jazz, blues history. I discovered a local scene and within that scene, I found Chicago’s Big C Jamboree. Although back in that day, it was just “rockabilly night”. It was about 10 people large at this bar called Batteries Not Included. 10 plus the bands which was basically the only 2-5 bands around. I was sorely disappointed in the size. I skipped the next few months. I returned after a friend suggested we go out. I went back and it had gotten larger! Then it moved to a bigger club because the other was too small. I met my original Honeybees through that scene. We formed originally just as me singing, my bassist (Lisa Crowe on electric) who sang sometimes. Well, she did often! It was always Theresa Drda on drums and various various guitarists starting with Bob. Eventually, Lisa sang full time with me and there was The Honeybees. Since, I’ve had 4 solid co-singers with guest singers in between finding the permanents. We’ve had about 5 bass players and about 5 lead guitarists. 15+ years. I’m confused at how old but I can refer to the original bass/singer Lisa’s oldest kid. She left us when she got pregnant. I should find out how old he is again. What’s your favorite spot on the globe that you’ve played? Everywhere! Everywhere global. Chicago is great too but nothing beats a crowd elsewhere. Somehow you get to be routine for the locals and they thrive on the out-of-town bands more. Hence, great to play elsewhere. If I gotta choose one, Barcelona. Outside, on either side of about one hour in each direction of the city, are two great weekenders. I just wanna be near the beach. Who do you admire musically? Geez Rocko! Can you answer this without filling up 3 years of pages?! I am all over the map. I admire men and women. Elvis, Janis, Wanda, Eddie, Carl, Johnny, Brenda, and that’s just the Rockabilly/Sun for starters. Etta, Ella, Dinah, Louie, Benny, then Fats, Little Richard, Screamin Jay, 20s-50s, then Stax, British, Ska, Rocksteady, Mod, soul, 60s, then because I grew up in 70s-80, I have to be honest – I know my Zepplin, Stones, Journey, Bjork, Clash, Blondie… I’m all over the century! I like originals, people who write their own. I enjoy a good cover but I really admire the ones who write their own. That’s the best answer I can give. I admire those who really sing/play with feeling. Not just the notes, not just a melody or someone who looks good & is a puppet. I admire people who play their own instruments too. I admire a good lyric writer. Poets. This question I can answer all day. Your first solo album, Introducing Barbara Clifford, is on it’s way. That title seems to promise a new beginning. Just who is Barbara Clifford, what’s she all about, and where is she heading? I’m a Chicago girl. A real city girl who can’t really choose 1 type of genre. I am doing all kinds of tunes on this. It’s a taste of all kinds of Americana styles I like. I’m 43. Finally doing this at 43. Took a long time. I am a singer, experienced in duos, tried it all as a duo, and this is the first solo try. I always said I wanted to make a solo record just to say I did it when my life is over. Feels good. Majority originals but of course, some covers. I’m in love with traveling and performing. This give me both. Where am I heading? Not sure. For now, performing and letting this CD run through the veins of the rockabilly scene and maybe the common music listeners. The passive. See if I can pass this to them. After its out there, I’ll see where I go next. This is primarily a Swiss band. The bass (Pierre-Yves Aufranc), drums (Roman Bader), and Juan Rodriguez who is the label owner as well. (Blue Lake Records) I met Juan through my boy, Martin Telfser. His band, Mars Attacks, was on the label when I met him. Juan, Roman, Pierre-Yves are a trio as well (John Guster & The Rhythm Storms) so their groove and rhythm are already tight. Guest musicians are Marco Hunziker on Sax, Pat Madison on Sax, Dusty ciggaar on guitar, Martin Telfser on rhythm guitar, Enno Geissler on rhythm guitar. I flew to Vevey, Switzerland where the studio is about 5 – 8 times. I can’t remember. Some just for rehearsals. It was easier since I’m a flight attendant. It was all recorded LIVE, another first for me. A much different process. HUGE THANKS TO KEN MOTTET FOR WRITING 5 SONGS! If you could reach any pinnacle in your career, what would it be? Hmmmm……………I’d love to write a big hit. Just one, even if it was sung by someone else, to be known by that one song, even if in a commercial or a movie or ?, and it gives me a life long royalty paycheck. That’s the pinnacle I’d reach for.